Instead of a bright spot we now have several dark streaks close to each other where the South Equatorial Belt on Jupiter is forming again: a flurry of often hi-res amateur pictures collected here and also here is documenting the first SEB revival since 1993 as fortunately the planet is far from the Sun (in the sky) right now. What has happened so far can be seen at one glance either in an animation spanning Nov. 9 to 20 or a series of Nov. 10 to 19. Image collections and selected images of Nov. 20 (more, more), Nov. 19, Nov. 17, Nov. 16, Nov. 15, Nov. 14 (more, more), Nov. 13 (more), Nov. 12 and Nov. 11. 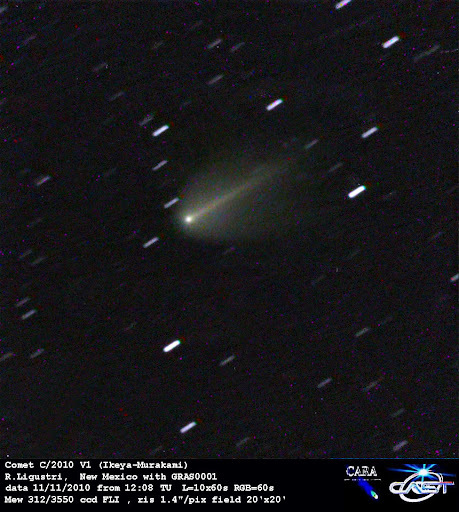 As John Rogers reports, the initial bright plume has appeared Nov. 9 inside the cyclonic circulation barge B2,which had been very dark a year ago, but turned white this May/June: "The rapidly brightening plume is so energetic that we can confidently expect it to develop into the SEB Revival. The SEB Revival is usually spectacular, so we can expect impressive and rapidly changing disturbances over the next 3 months, until the end of the apparition. As the SEB is so thoroughly whitened, and the outbreak has appeared in an isolated location, we can hope to see the phenomena displayed in their most complete form." • For something completely different - but Jovian - a report on a partial eclipse of Callisto on Nov. 12. 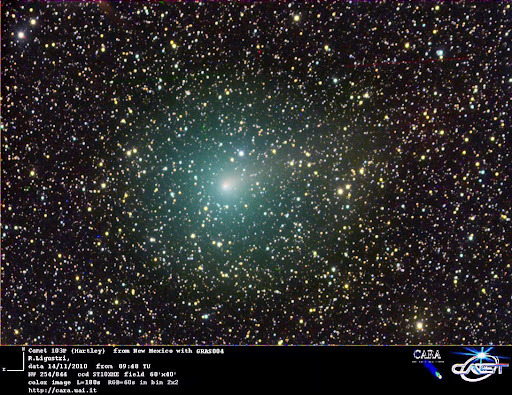 From the world of comets two bright sungrazing comets in rapid succession, on Nov. 13/14 and Nov. 17 (video, still, earlier), a picture showing C/2010 U3, the new very distant comet, some suggestion that 236P has split (similar). 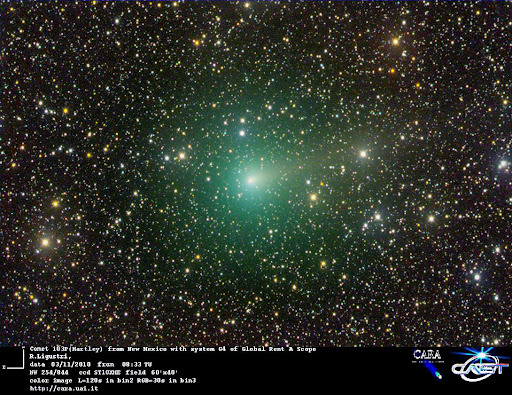 • From comet C/2010 V1 a Nov. 8 ... 18 panorama and pics of Nov. 15, Nov. 14 (more, more), an animation til Nov. 13, a series of Nov. 9 ... 12 and a pic of Nov. 6 (comment). 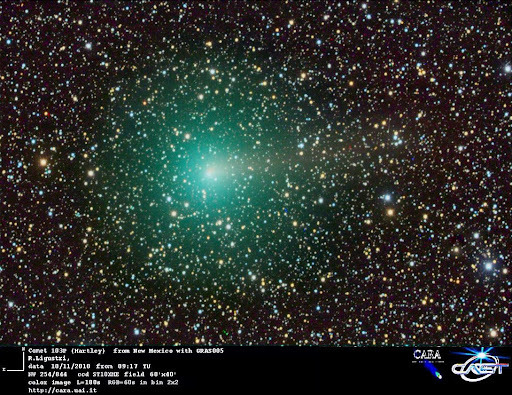 • And of comet 103P pics of Nov. 16, Nov. 14 (more, more), Nov. 13 and Nov. 12 (more) - plus new cool EPOXI pictures released. 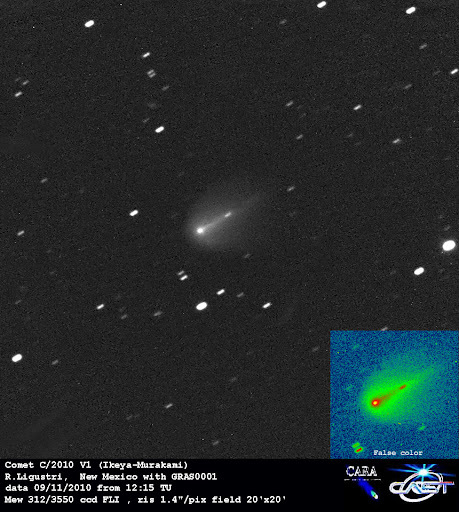 • Tiny asteroid 2010 WA came close: discover, spin, earlier, other stories. • And more thoughts on Eris & the dwarf planets (more, interview, comment, yet another story). The Leonids reached a max. ZHR of about 30 late on Nov. 17, according to the data as they stand now: another and another summary (earlier, other story). • Some ideas re. possible meteor storms decades ahead. • A Croation bolide and a Serbian one (more [translation], more, more and more). • An interview with the Meteorite Men, a story on 2008 TC3, and a possible crater on Ararat. • planets in the morning of Nov. 12. • A magnetic feature on the Sun and more Solar hype. • NASA on the mistaken contrail (picked up here and here; more) - and J. Moos and J. Steward on the whole affair! • Someone made a 1-hr documentary on Epsilon Aurigae. • And a glorious startrail picture was taken in India with two cameras simultaneously. 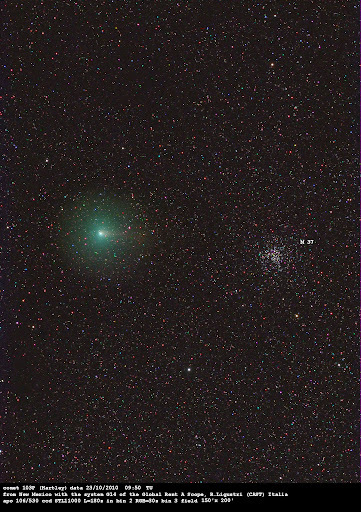 A double visual discovery of a comet in outburst happened in Japan in early November: In a place where one of the two observers hadn't seen anything the day before, suddenly a comet was seen (a report from the other discoverer), first causing excitement (a close bright NEA?) 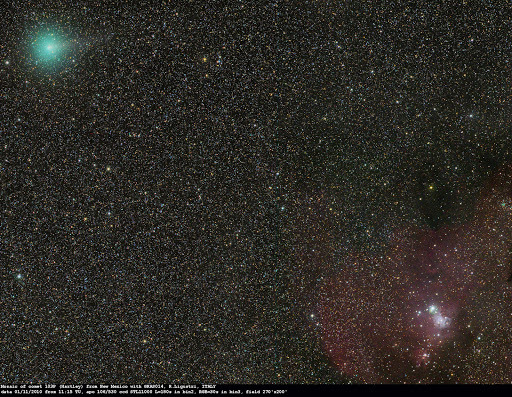 before the cometary nature was clear and a number and then the names were assigned when a first orbit was known. 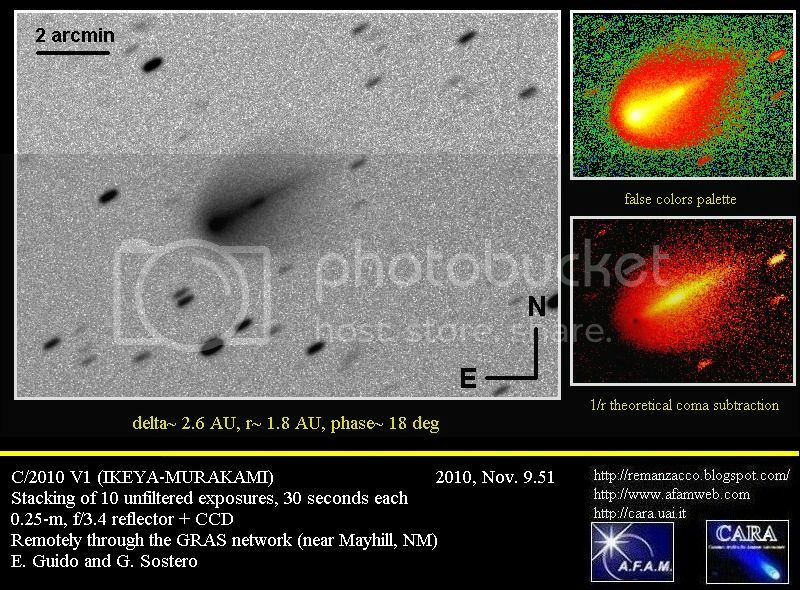 Comet C/2010 V1 (Ikeya-Murakami) has since evolved quickly, a bit like outburst comets Vales and Holmes: selected pictures of today (more), Nov. 9 (more, more; wide), Nov. 8 (more, more), Nov. 7 (more) and Nov. 6 (small; also a visual report). More stories - not all accurate! 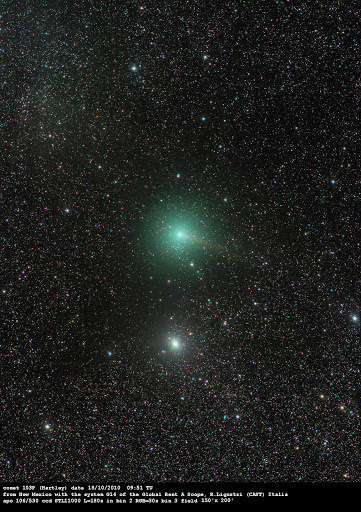 - about the new comet here, here, here, here, here, here, here, here and here. 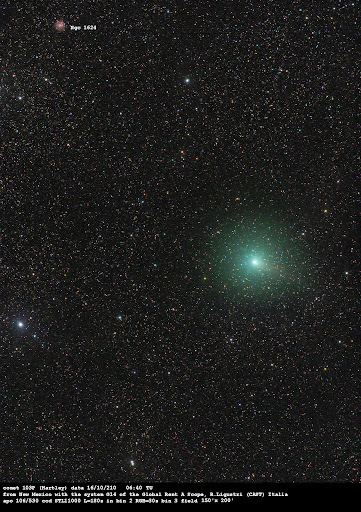 And a particularly stupid one, mistaking an airplane trail for the comet ... • Another interesting comet discovery is C/2010 U3 (Boattini) which will reach its perihelion only in 2019 at 8 AU from the Sun! For the first time a star occultation by dwarf planet Eris was observed by three (small) telescopes in two locations in Chile - and the preliminary analysis suggests that Eris and Pluto are about the same size, with current error bars overlapping (if the body is a sphere, 3 points = 1 1/2 chords are enough to fix the diameter). Which also means that Eris has an extremely high albedo as well as (predominantly rocky) density. The forecast(s), an early report (more), a video, early thoughts by Eris' discoverer (still earlier; more) and stories here, here, here, here, hier, hier und hier. 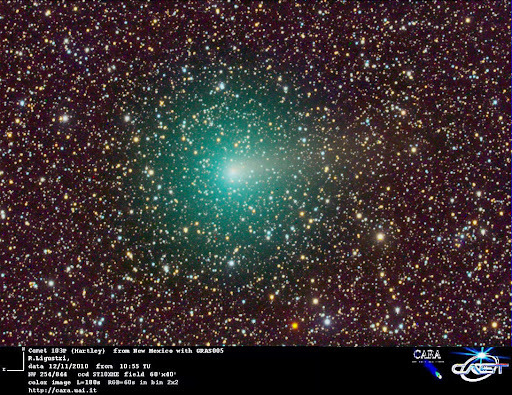 • Perhaps the biggest TNO is still to be found as surveys in the Southern sky are taking off only now. Plus various Centaur & TNO tidbits from a recent conference. 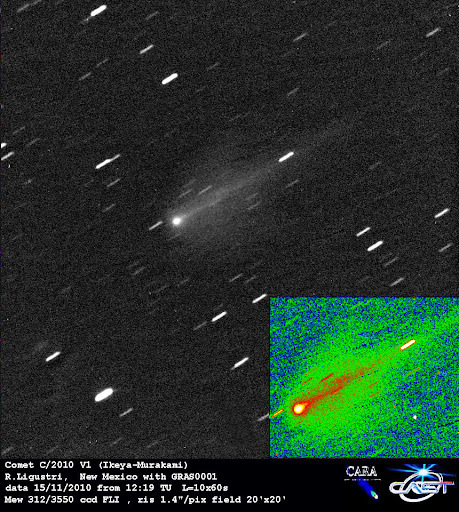 • From small bodies closer to home: another bolide caught on camera, expectations of an improved orbit for Apophis from 2013 astrometry, and a live plot of the Leonids ZHR; not much there yet. The revival of the SEB of Jupiter seems to have begun with the appearance of an isolated small bright spot: early summary stories at Planetary Society Blog, ALPO Blog, ALPO Japan, Sky & Telescope (earlier) and SpaceWeather. You can check here what Jupiter is doing: The Nov. 9 page has the first indications, the Nov. 10 collection many more confirming images. Events are also tracked on Cloudy Nights. • A Jupiter trail with Diwali fireworks in India, and Venus + the waning lunar crescent on Nov. 5 (two more views); also Venus on Oct. 31. • Proof that you can track an exoplanet transit with a cheaaaap telescope (selling for some 50 EUR), though a good CCD camera is also required. Many spacecraft are observing the Sun right now, including some lesser known ones like Proba 2 and Picard; we also have new results from the Sunrise balloon flight and details about SDO's operations. 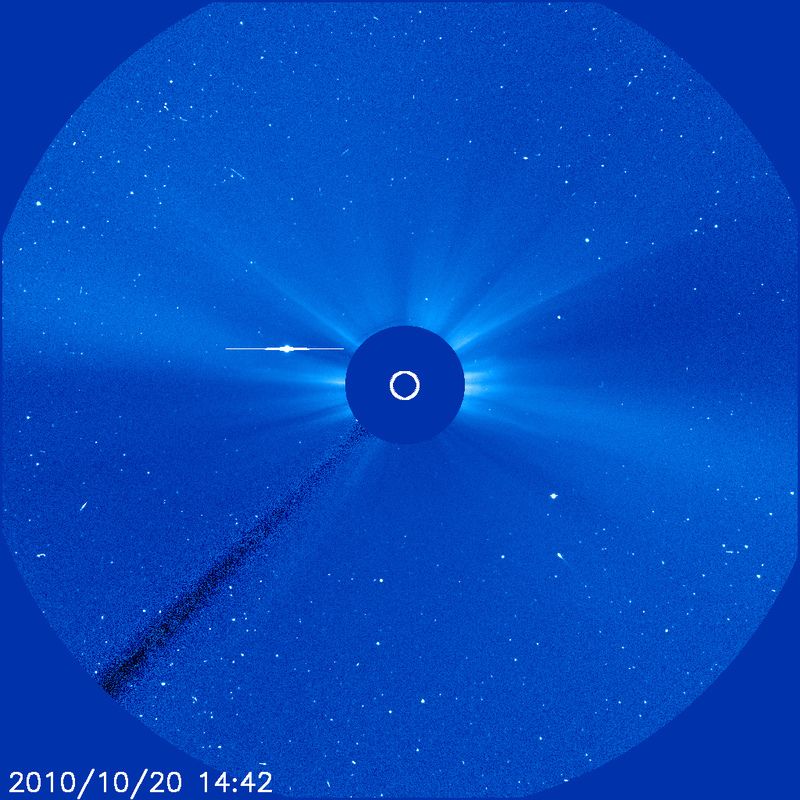 • There was a major flare on Nov. 6 (more, more) as well as on Nov. 3, the physics of CMEs are discussed, and in Egypt space weather experts meet. • A 12 mag. supernova and the distance to Eps Aur. 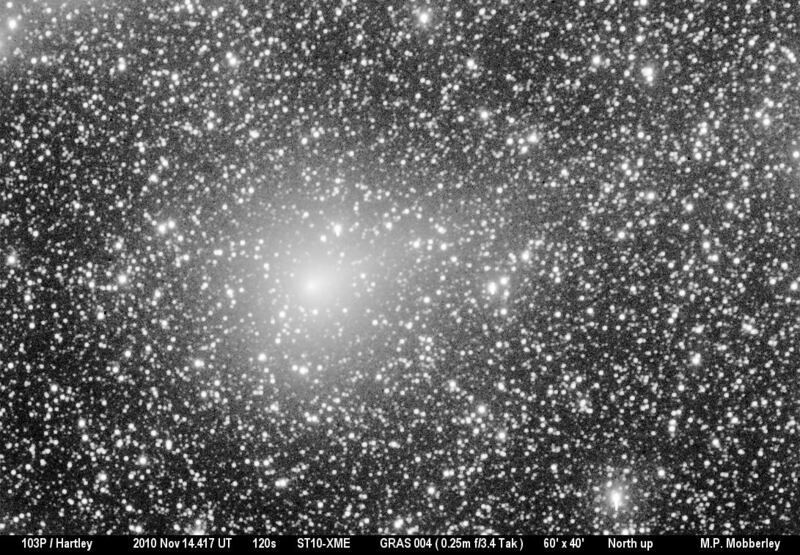 • A big ESO competition for image processing buffs. • A misunderstood airplane contrail (more, more, more and more - also a similar shot by yours truly). • And Soyuz debris found in Australia. 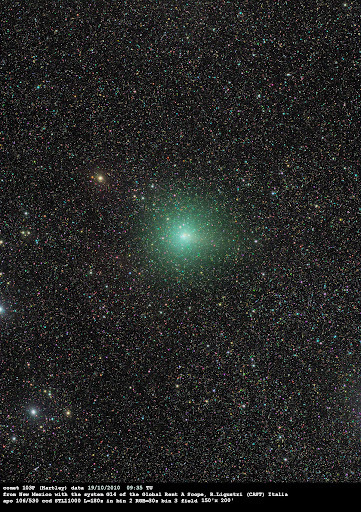 All that's been said about the difficult viewing conditions for 103P/Hartley (2) despite its fine overall brightness still holds true two weeks later, now that the Moon is gone and it's observable again high in dark skies after midnight (in the N hemisphere): The comet - information collections here, here, here, here and here (esp. 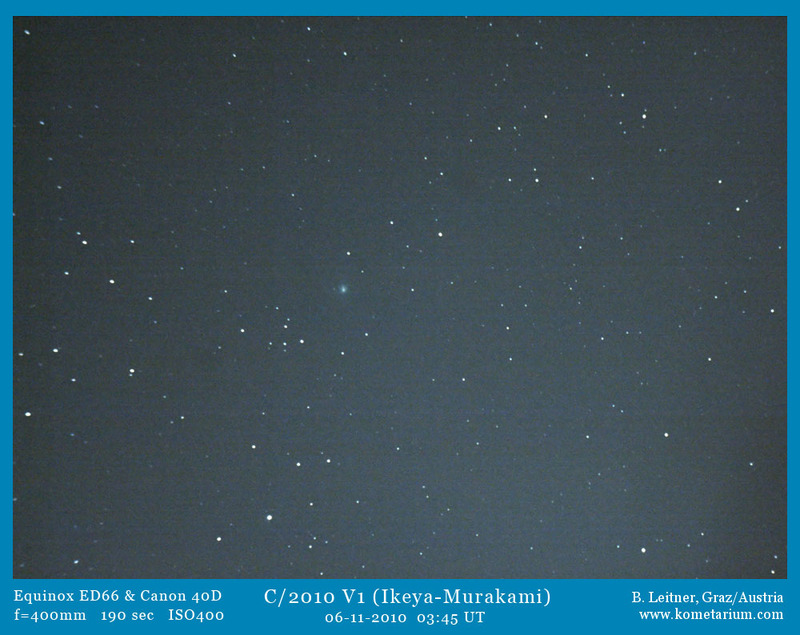 on the space mission) - is as hard as ever when the sky isn't great, also observed here and here. 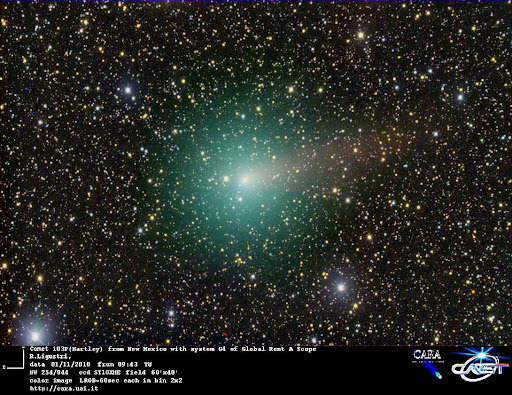 Selected pictures of today (note the growing tail; also a wide view with a nebula), Oct. 30, Oct. 26, Oct. 23, Oct. 22 (more, more), Oct. 20 (no tracking! ), Oct. 19 (also an Oct. 13 ... 19 collage), Oct. 18 (near Eps Aur; more, more), Oct. 17 (more and esp. 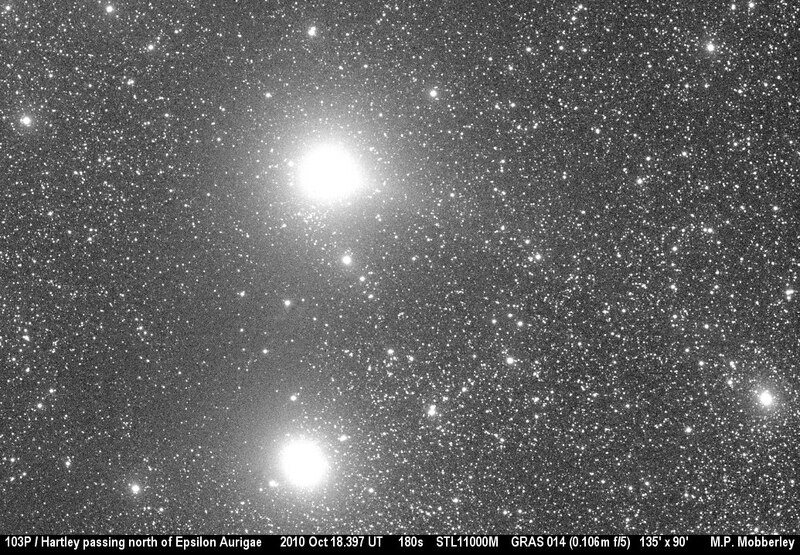 deep), Oct. 16 (more, processed) and Oct. 15 (animation). 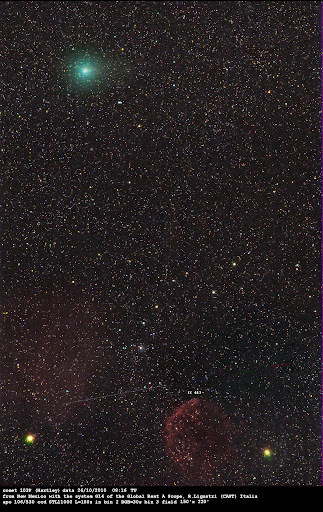 Also an Oct. 12 drawing (context), an Oct. 8 super-wide view (context, more) and a September Subaru image and development sequence (small and medium). 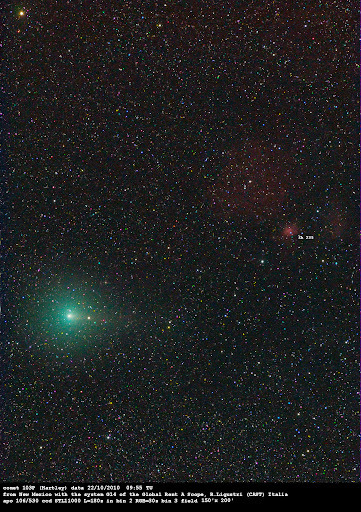 In other small-bodies news there was a bright sungrazing comet (more, more, earlier, LASCO C3 video and still, plus the context). 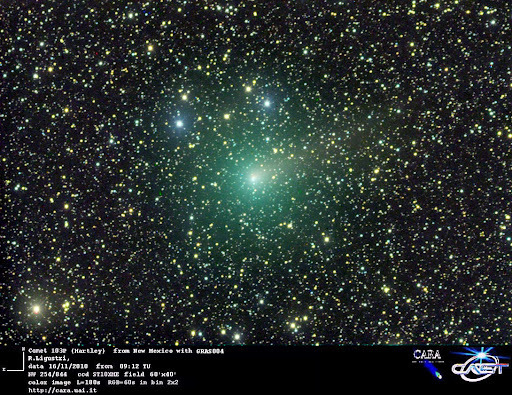 • Some strange is happening with comet Tempel 2 (context), there is a new comet Hill, and PanSTARRs has found its 1st comet. 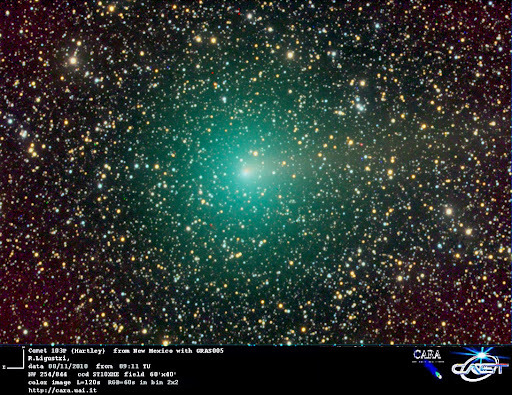 • The rules to be a "discoverer" have changed again, and there is a new place for comet observations. 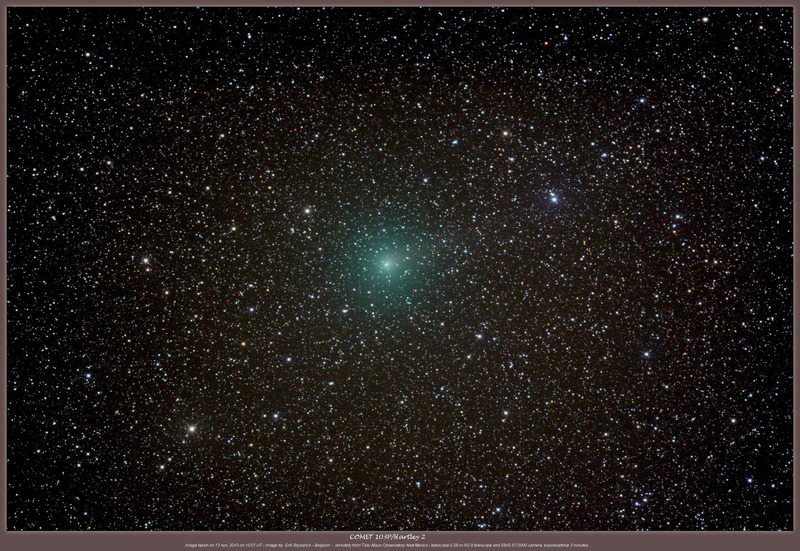 • Fine bolide videos here and here - and the possibility of meteors from comet Mellish. 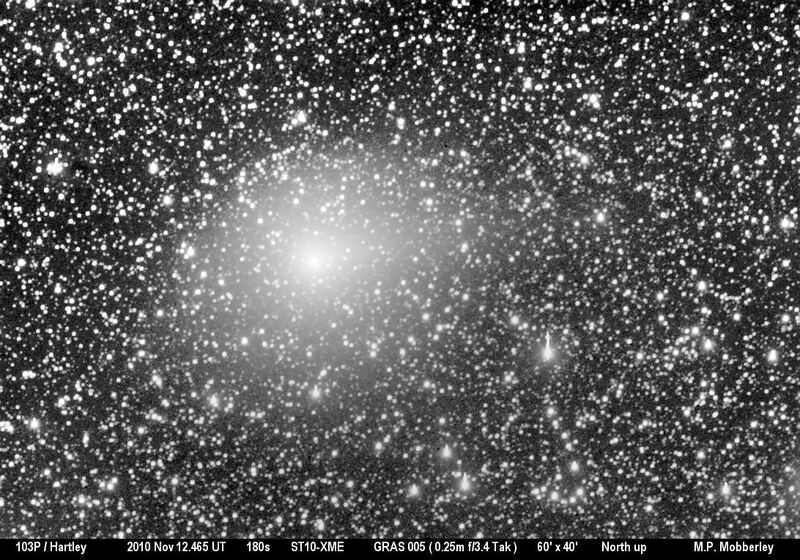 • The close passage of minor planet 2003 UV11 (more, mehr & mehr) was documented e.g. here, here, hier and hier (more), with earlier observations here and here (more). In other news interesting views of Venus on Oct. 31 near inferior conjunction (also its sky track; more), a lot of Saturn moon events in 2009/10 and - older - adaptive optics views of Uranus and esp. Neptune with the Hale telescope. 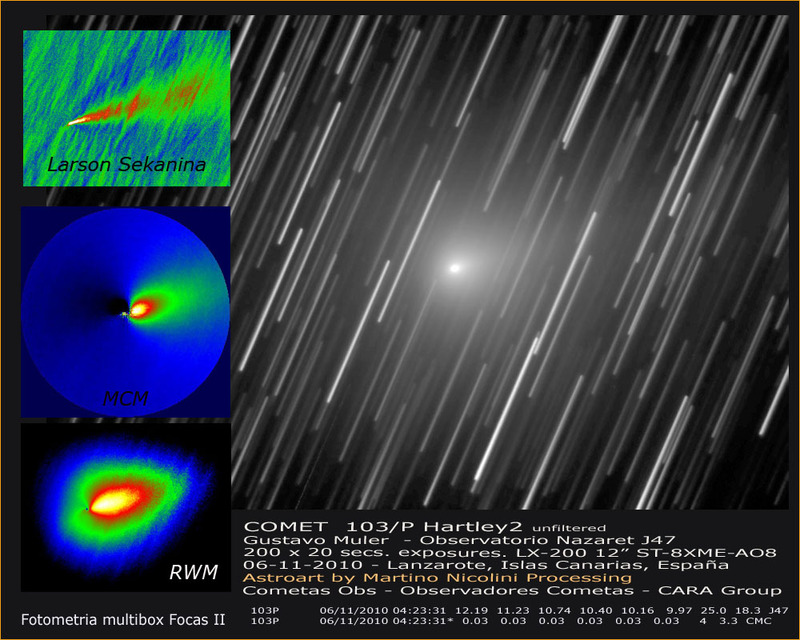 • Sunspot 1117 was substantial, an old butterfly diagram has been reconstructed, new insights into aurora physics, the solar storm watch in action and ways to observe the Sun. 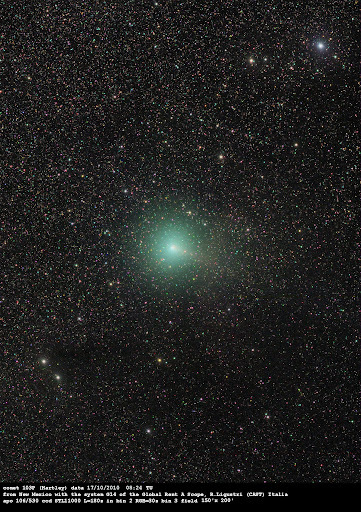 • The 1st Irish supernova, the results of the U Sco campaign, the ISS on the Moon, a great timelapse collection and a huge all-sky with the gegenschein et al. (an earlier such view). 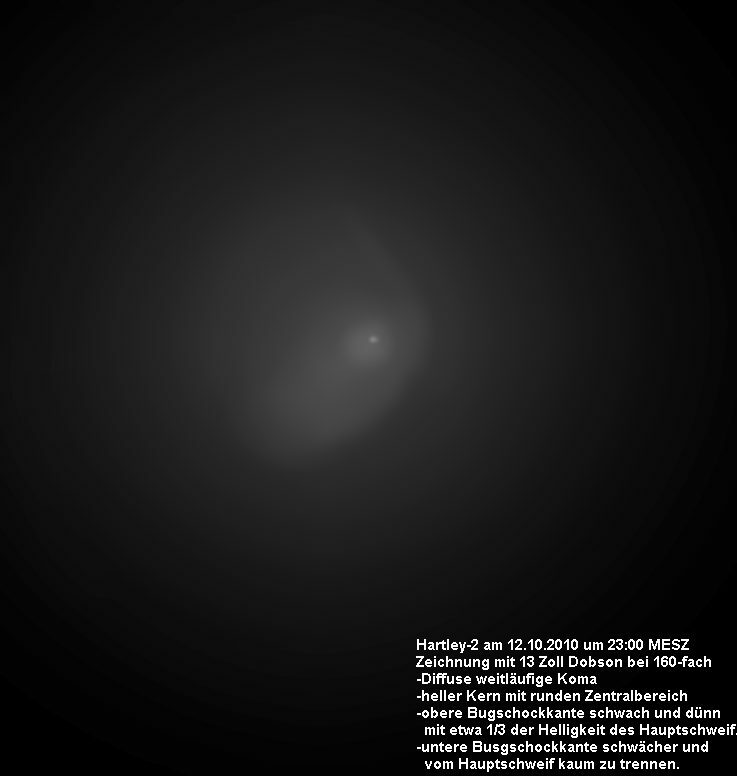 • Finally there isn't anything special expected in November (mehr), so we rather look forward to the meteor showers and other highlights (mehr) of 2011.